We’re pleased to show the work of Louise Ellis once again at Cayuse. 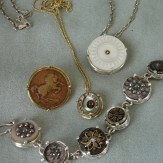 Louise works with vintage and antique buttons, setting them in sterling and gold to create one-of-a-kind jewelry. She uses early hand carved shell buttons, industrial age gilt buttons, work buttons from uniforms and dungarees, and many of the buttons have a rustic, western, or equine theme.